Vote Report: Help NPR Identify Voting Problems Report any problems you encounter at the polls and look through an interactive map that shows eyewitness accounts of voting irregularities across the country. #zip code to indicate the zip code where you're voting, for example, "#20002"
L:address or city to drill down your exact location. Example: "L:1600 Pennsylvania Ave. D.C."
#machine for machine problems, Example: "#machine broken, using prov. ballot"
#reg for registration troubles. Ex. : "#reg I wasn't on the rolls"
#wait:minutes for long lines. Example: "#wait:120 and I'm coming back later"
If you have any voting problems, NPR wants to hear about them. As part of Twitter Vote Report – a project born out of a collaboration of volunteer software developers, bloggers and the NPR social media desk – we'll be monitoring voting irregularities, everything from long waits and broken voting machines to polling places with insufficient ballots. An interactive map will track election problems reported by voters. 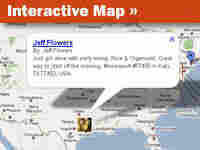 The map will display eyewitness reports as they come in, so most of them will not be verified by NPR. As reporters look into some of them, you'll find stories on our voting problems page. Text: Send a text message to 66937. Begin the message with the phrase #votereport, include your ZIP code and a very brief description of the problem. 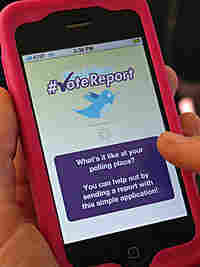 Twitter: Send a tweet with the phrase #votereport making sure to include your zip code and a description of the problem. iPhone and Google phone: Download the iPhone app from the education section of the iPhone app store. For the Google phone, go to the Android Market and search for "votereport." YouTube: In conjunction with PBS and YouTube's Video Your Vote project, you can upload a video to report any problems you experience. Please note we will not be able to resolve individual polling place problems, so make sure you also contact your local election office or voter assistance group for help. Also, be mindful about any local restrictions against using mobile phones or other devices while at your polling place.